I forgot to tell you, but in 1.29 on iOS uploading to community content is re-enabled, as is browsing of the entire content, not just the whitelisted items. Hooray! Because this is a fresh free app, it needs all the clicks and downloads it can get. Please go to the app page. If you have an iOS device, please download it. It’s free and you can try out all the new 1.29 features while waiting for full version to be approved. You can also start making 1.29 screenshots for the contest. One day and night should be enough to set it up. Just remember about the settings. If you want to help further, you can also type in “Survivalcraft Day One” in the search box on app store. The more searches, the better app ranking. The new big feature is going well so far. It’s not a meteorite, boulder or a new way of digging blocks, it’s something cooler, especially for the creative mode people. OK, no more hints. Btw. once this is finished, I also plan to add something of interest for survival guys too, no worries! And don’t forget about Day One, it needs your help this weekend! This entry was written by Kaalus, posted on January 23, 2016 at 13:14, filed under Uncategorized. Bookmark the permalink. Follow any comments here with the RSS feed for this post. Post a comment or leave a trackback: Trackback URL. Hmm, so that rules out quicksand then. Cool man i cant wate i am still working on my town.And then i am doing a lego town oh yeah. i would love to have some people to put in my town. Just downloaded “SurvivalCraft Day One”! But now I’ve absolutely no idea of that “Thing” of 1.30… But is Something related with Sand? I think I am right with my old guess. It is some kind of “tool” for creative bulder to generate structures. Kaalus I have some examples of light bugs if you are interested. Why would be make an engine from soil? Great love the creative stuff… Will download an rate day one too. Micro blocks might be an option, but more likely a building tool. I just cannot see how a building tool will need 32 bits. So it is more like micro blocks or sculpturing. It is quite interesting that Kaalus shot down other things but not micro blocks. Micro blocks implies that different types of blocks can be used within one block. This will be too much data. So sculpturing is more likely. This will however increase the file size of the worlds a lot of you use this a lot. But it is something he has never talked about. Kaalus, if it is sculpturing, please make an option to copy an item into your inventory, so that we can duplicate stuff easily. Nice! 20 searches and download complete! Can’t wait to check out the new caves!!! Will be the case an editor of worlds, as in minecraft world edit? So, no carving blocks. By the way, Day one will be awesome for IOS players! Awesome! I will play it! What has this world come to where Google play dosint have Survivalcraft !!!!! Why is it not there ??? Why?? Probably because google play gets the update first, so it’s not needed. There was for ios too. Wonder what the survival themed thing is…hope it’s awesome, as usual! The ability to copy and paste sections of blocks? The ability to copy and paste sections of blocks?? Copy and paste sections of blocks?? Oops sorry guys, it said it didn’t post as the comment was a duplicate to an earlier when I assumed it really hadn’t posted. Could we please possibly get, the ability to chop down trees? As opposed to chopping up? Kaalus, did you watched the bug video link i sent you via gmail? Why did the “Apple store” approve survival craft day one but not the update. Is 1.30 update going to be more about survival features than creative features? OK last one. Cave trees! 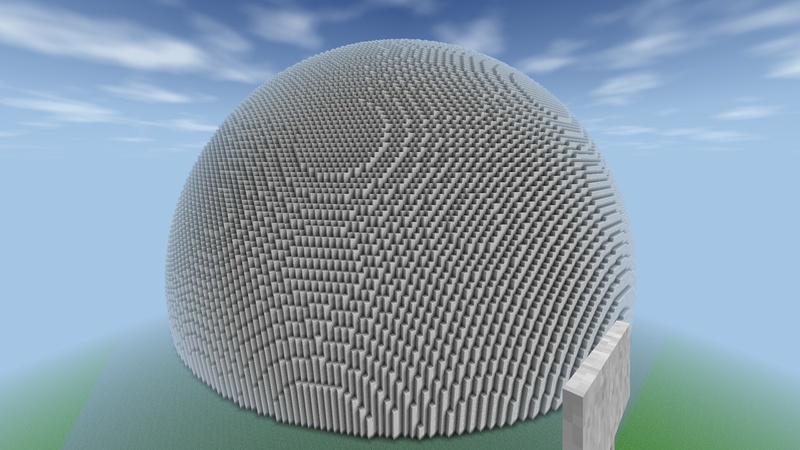 And here we have the largest sphere ever made in survival craft! 120 block radius, since the max height is 128 and the ground is 8 blocks high. It would look better if the view distance could be more than 256. This was generated with my tool by the way. If anyone is interested in a test version just let me know. How did you get the tool? I made it. That’s why I said “my tool.” When I finish up a bit more I’ll be releasing it on the forums. Wow thats awesome!! im interested in ur tool (= could really help me on some worlds. Hangouts? What do you mean? Is it in MY account? I’m very interested by your tool ! I can test the tool ? Yeah, how can I contact you? Oh lol, I hadn’t expected people to notice it yet. I was still in the process of designing it. I would love to see a massive cilinder next! It should be easier than that sphere! Well actually, cylinders are a bit more complex than spheres… They just don’t take as much math. But anyways, I already have cylinders implemented. And, Justin, check your hangouts messages! That is very awesome. This tool you developed is pretty cool. How do I get to handouts? Will it work on mobile device like my tablet? And can you make massive walls? Yes you can make massive walls. As massive as you want them in fact, as long as you aren’t exceeding SC’s height limit. The program itself only runs on PC, but works for all worlds from any device. Now about hangouts, you can get on it on like any google site or the Hangouts app itself. I tend to just go to mail.google.com, plus.google.com, or hangouts.google.com. @Justin: I changed my blog up a bit today, now the main page is all about my tool. Check it out! Google? I think of the number when I hear that name Even though it is a search engine…. I learned just this year how to use my gmail other than to get games on the internet…..
For this one I used decreasing tolerances, each with a different block. 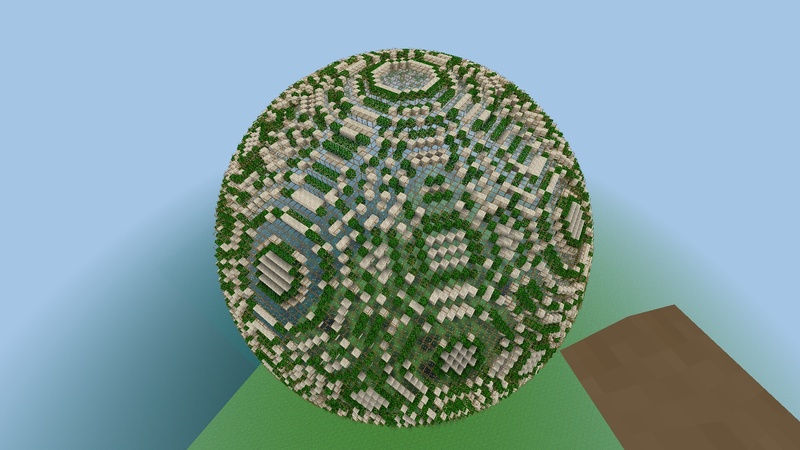 Also this one is just a 50 block radius, just sticking to my view range. 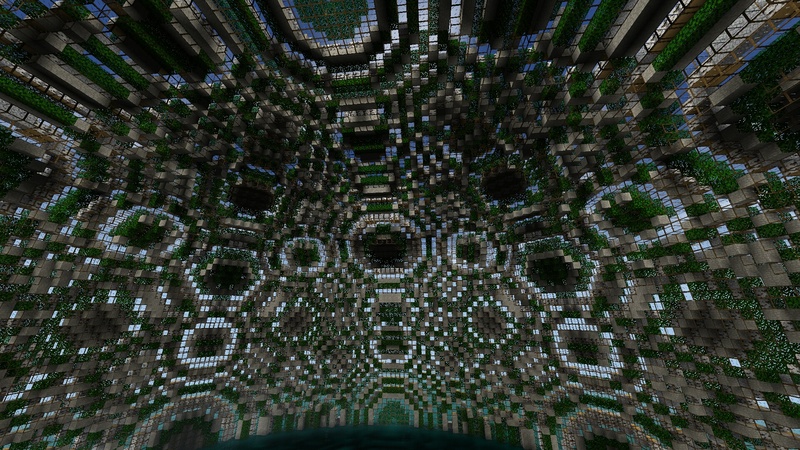 Here is the inside of a sphere made the same way as this one, but with more tolerance levels. I’ll go download and search for day one, ty Kaalus. What’s up with the iOS App Store? Searches for “survival craft day one”, which had one search result this morning, now shows as zero results now. Has it been removed from the App Store???!!! Never mind. It has reappeared. Weird. Off to do more searches! One more question though. I’m loving the caved…but is the higher frequency of ore just dur to the expansiveness of the caves? The second one I entered had at least 30 diamonds exposed. Well obviously the size is going to double, we have doubled the bits contained in each chunk’s blocks. Did you think doubling from 16 to 32 bits wasn’t going to impact it at all? I think a cool feature woul be a spot light. For example at night I have an electrical set up where lights turn on when night comes. I don’t know. I think spot lights would be cool.